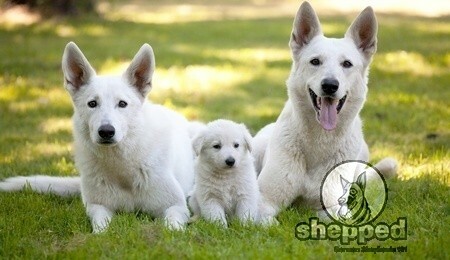 German Shepherds have a dense, flat, coarse, straight coat that lies against their body. They have an undercoat that is soft and thick. The outer coat can also be slightly wavy or long. While the classic look of a GSD is tan and black with a black saddle, there are also a variety of other color combinations and solid colors. If you are interested in showing your GSD in the popular show dog industry, there are color requirements that have been set in place by the American Kennel Club. To show your GSD he or she will have to exhibit rich, strong colors and have a dense medium length outer coat. Colors such as livers, blues, pale shades are considered faults and solid white German Shepherds are disqualified from the competition. While the AKC may immediately disqualify a white GSD from a dog show, many dog owners around the world actually seek out the beautiful white GSD. They are known to have an overall calm, mellow and sensitive personality compared to the black and tan GSD. Due to their sweet demeanor, they are popular family pets instead of guard dogs. 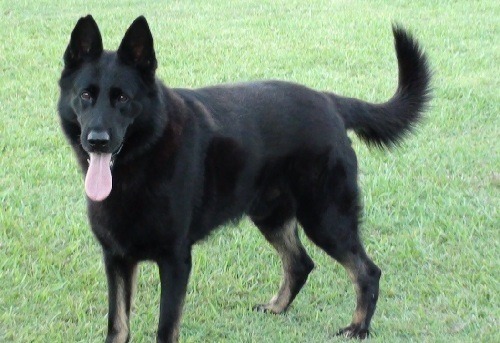 The solid black GSD is commonly mistaken as a mix breed, but they are 100% German Shepherd. This mistake usually is due to uncommon sightings of the beautiful shiny solid black coat compared to the popular multi-color GSD. 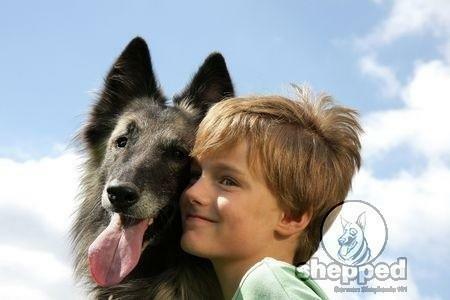 The Black German Shepherd has a traditional look of the breed and is slightly larger than the standard German Shepherd. Their coat can be flowing, long, skirting, feathering or short. 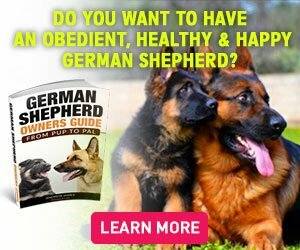 Many dog owners commonly have their heart set on a specific type of German Shepherd that they would like to welcome into their family. At times that special color combination or solid colors may not be available in your area. You will have to do some searching into nearby cities or even states to find the special dog you are looking for. Remember always to deal with a reputable breeder that treats their dogs with respect and takes good care of their health. Many dog owners will say that their GSD has the most beautiful coat. But the truth is all German Shepherds are beautiful. Dog owners or potential GSD owners may wonder how to take care of the beautiful the beautiful coat. Below are tips on how to care for a German Shepherds coat that will keep his coat shiny, clean and color glowing. It is quite easy to keep a German Shepherds coat looking and feeling its best. Dog owners should keep in mind that the GSD frequently sheds so brushing sessions will be highly beneficial. Make sure you use tools such as a regular dog hair brush, rake brush and metal comb to remove the undercoat and distribute oils. Many German Shepherd dog owners enjoy bathing their dogs while others prefer taking them to the groomer. If you choose to bathe your GSD, there are a few tips that will help you complete the process quickly. Some dogs enjoy splashing around while taking a bath, while others may try to run from the situation or hide when they know they are about to take a bath. Try these helpful tips when you feel like you have your hands full with your GSD. Step One – Prepare the bath area with towels, warm water, the shampoo and conditioner bottles and any other tools your GSD may require to keep his coat healthy. Step Two – Ask for help. See if anyone in your household is willing to help you give your GSD a bath. Two people will make the process go a little quicker since one person can hold on to the dog as the other washes. If your dog loves to take a bath, you both can bathe your dog quickly. Step Three – During the bathing process first wet your dog with lukewarm water then begin pouring the shampoo into your hand to wash his coat. Always use an open hand when washing your dog. Digging your nails below the surface of his coat and reaching his skin might seem like a good idea, but it can actually cause small cuts that can bleed and later become infected. Step Four – Rinse the shampoo and conditioner off thoroughly. Take your time with this process and make sure all residue is removed. If there are any shampoo and conditioner left behind it can dry and cause irritation to your GSDs skin. Step Five – Dry excess water off with towels or allow your dog to air dry indoors at a tepid temperature or outdoors in the warm sunshine. If you find that your German Shepherd has a sticky residue on areas of his coat, it is wise to comb carefully through it with a fine-toothed metal comb. Always start from the tip of the hair and work your way down close to the surface of the skin, being careful not to scrape the comb against the skin.